Revive was initially developed in Denver in 1972 in response to a water shortage created by lack of treatment facilities by the Denver Water Board. Revive’s original market was geared towards professional groundskeepers. Revive was introduced in 1977 to the public through a Denver, CO lawn care company called Ever-Green Lawns. Ever-Green Lawns had great success with this new product. When the Denver area saw water restrictions again in 1979, Revive helped save many dry, stressed lawns. Up until this time, Revive had always been a liquid formulated product. The need to develop Revive into a granular formulation became apparent to give users more options for application flexibility. Here’s a look at the second generation of packaging. After some research and testing, it was determined that attaching Revive liquid ingredients onto a DPW (Dehydrated Poultry Waste) granule made a superior product. 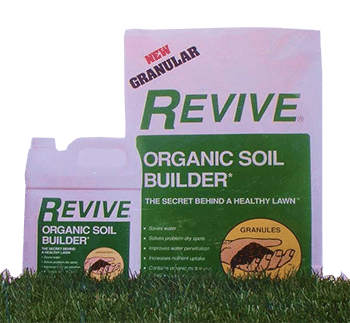 Not only do you receive the benefits of a normal liquid Revive application but in addition, some organic fertilization nutrients are supplied to the lawn. 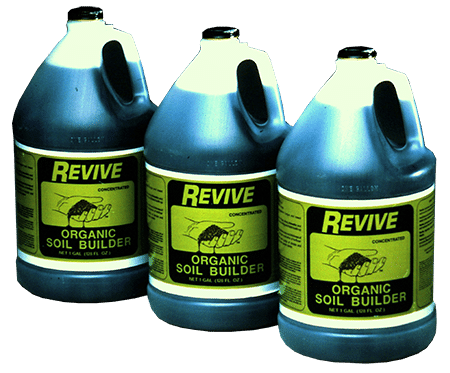 In 2000, Revive introduced a new ready-to-use liquid product that requires no measuring and mixing. The 64 oz. Ready Spray bottle is perfect for spot applications or homeowners with smaller lawns. Also new, was a 3rd Generation look to the packaging design. Revive saw significant growth and success during the drought of 2002-2003. Many new homeowners who weren’t familiar with Revive and how well it worked during times of water restrictions & rationing, saw the benefits of 1-3 applications of Revive immediately. Homeowners began incorporating Revive into their normal Spring and summer lawn maintenance program whether there was a drought or not because Revive reduced their water bills and gave them a thick green lawn which was the envy of their neighborhood. 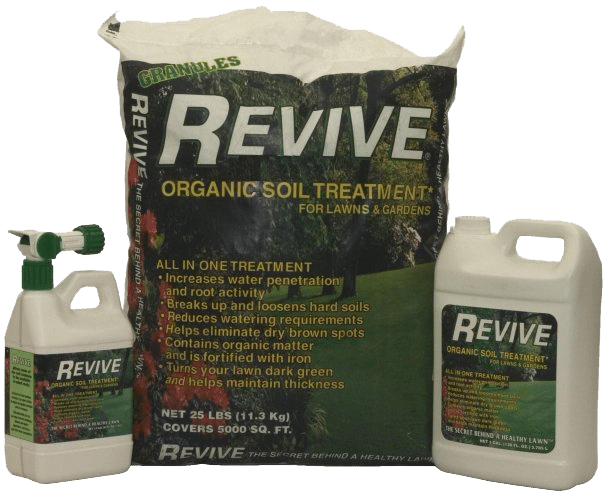 During the 2000s, Revive also participated in many different independent tests on a wide variety of crops, be it turfgrass, corn, sugarbeets, or wheat. 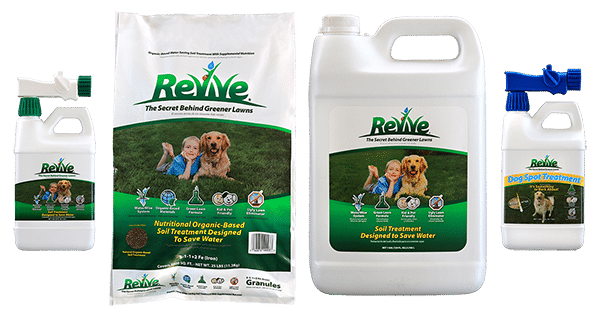 In all the studies conducted, Revive stood out as a product that reduced water consumption, increased yields of agricultural crops, and would give homeowners a greener, thicker lawn. In 2011 we added Dog Spot Treatment to our lineup in response to market feedback that pet owners needed a product that helped solve this problem. Revive entered 2013 with a new packaging design. The packaging change also incorporates for the very first time in company history, a logo change. Customers will notice the logo featuring a ladybug and water drop with the Revive letters made to resemble blades of grass. With continued drought talk and water conservation being a hot topic regardless of annual rainfall amounts, Revive can and will be a vital component to anyone’s lawn care program and is proud to help professionals and homeowners alike to maintain a quality stand of turf on any budget.